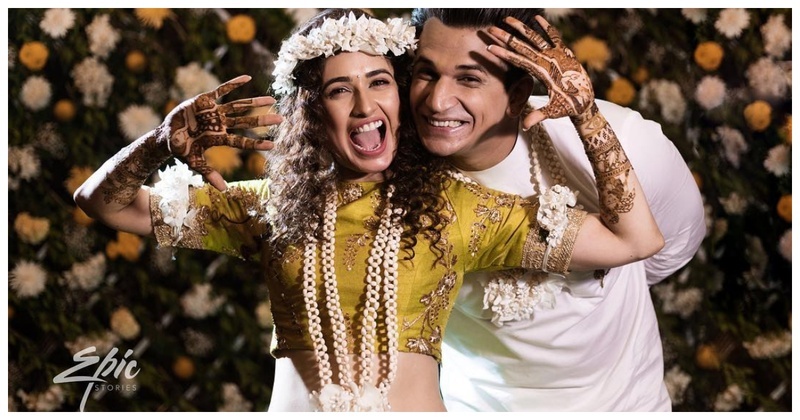 Everything that went inside Prince Narula and Yuvika Chaudhary’s Mehendi and Engagement ceremony! Yuvika took the traditional punjabi route and chose to wear green for her mehendi. She looked gorgeous in a olive green Akashi clothing lehenga skirt of ankle length. What I loved the most about her look is her choice of floral jewelry! She complimented her green lehenga with all-white floral jewelry from Adirag made up of fresh flowers. Also, her Prince charming *literally* complimented her look in an all-white pajama-kurta. Though Prince had already proposed Yuvika with a gorgeous ring, the couple formally celebrated their engagement post the mehendi. They exchanged rings in a very intimate ceremony and looked every bit of the definition of ‘truly-madly-deeply in love’. While Prince opted for the same attire, Yuvika changed into a beautiful embellished red lehenga from Payal Keyal with minimal jewellery and make-up. With mehendi like this, I can hardly await the sangeet tonight!